Deodorant, anti perspirant, whatever you call it, most of us use it. It’s probably one of the most repurchased items in your bathroom, and you’ve probably been buying the same one, or the same brand, for years. Unlike skincare, where we chop and change brands and search for the best hydration or anti ageing effects, anti perspirant seems to be something that nobody seems to pay that much attention to. But while we take care of our faces, our poor underarms are being attacked from all angles with waxing, shaving, IPL, Laser and even those epilating devices. No wonder the skin can get dry and bobbly with all that going on. Studies have shown that if you shave your underarms, 36% of what you are shaving off is skin! Imaging doing that to your face and then not moisturising it after! 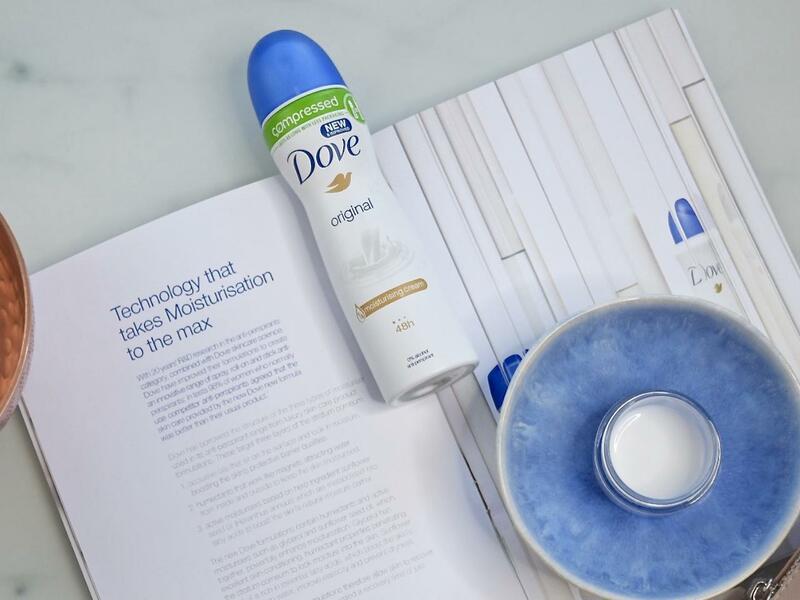 To rectify those neglected underarms, Dove has upgraded it’s formulation for the entire range of spray, roll-on and stick anti-perspirants, to include not only the signature ¼ moisturising cream that Dove anti-perspirants are renowned for, but also the same skin care ingredients that are used in luxury face creams. The ingredients include glycerol, a humectant which draws moisture into the skin to keep it hydrated, occlusive oils which sit on top of the skin to lock in the moisture and sunflower seed oil which boosts the skin’s natural moisture barrier. Dove believes that the skin on your underarms is as precious as the skin on your face, and we should care for and look after the skin on our underarms too. I completely agree, and in some ways the skin of your underarms is actually more important from a health standpoint. That’s the area where your sweat and lymph glands are which are very important for bodily functions. I’m starting to feel a bit guilty for neglecting them for so long! The beauty brand invested 4 years of research and development into making its anti-perspirant formulation even more caring than the existing range. So now it not only gives 48 hour sweat protection, it delivers rich moisturisation for an often sensitive and neglected area of the body. Does Your Armpit Look a Bit Dry? Before I started testing out the new formulation I thought ‘hmm how bad can my underarm be’? So I went and had a look in a mirror. I also realised that was probably the first time I’d ever looked at it without looking to see if it was hairy or not. Oops! It did indeed look a bit sad and dry. So I encourage you to have a look next time you’re off for your bath or shower, show that armpit some love! Or at least look at it to see if it’s alright as chances are it’s a lot dryer than you thought. I’ve used Dove for a very long time for both shower products and anti perspirants. I have always found the regular (prior to reformulation) deodorants more gentle and caring than other brands and I like the packaging, that they work to prevent sweaty marks and smells and I love all of the different scents. 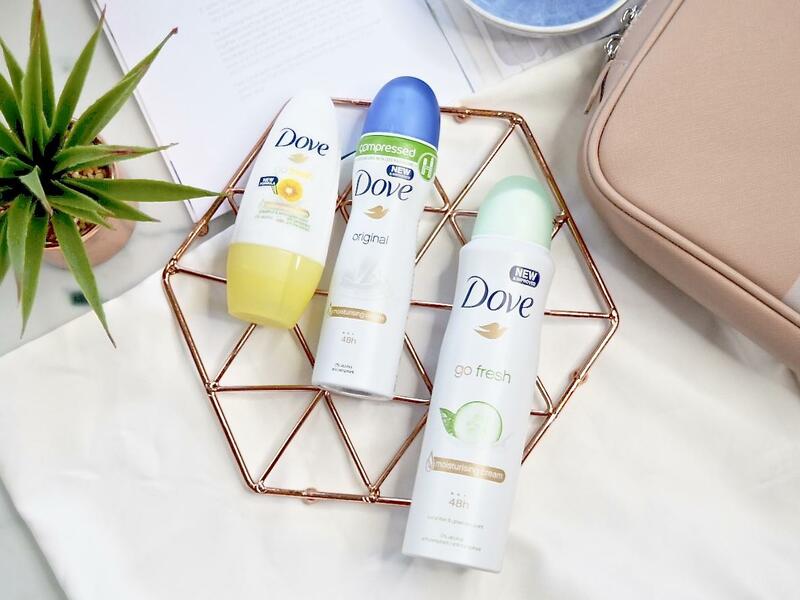 So I want to ensure you know, if you already love Dove anti perspirant, that the reformulation hasn’t affected any of these fab things you might already love, it has simply made the product more gentle and more moisturising. If you’ve never tried Dove anti perspirants before I absolutely suggest you go and grab one of their newly reformulated ones and see how you get on. You can get them everywhere from the supermarket to every drugstore I’ve ever been in. They are almost always on some sort of offer in one shop or another and they are really inexpensive. The Go Fresh range comes in either a 250ml spray, a 150ml spray or a roll on and the Invisible Dry, Soft Feel and Original scents also have stick options. 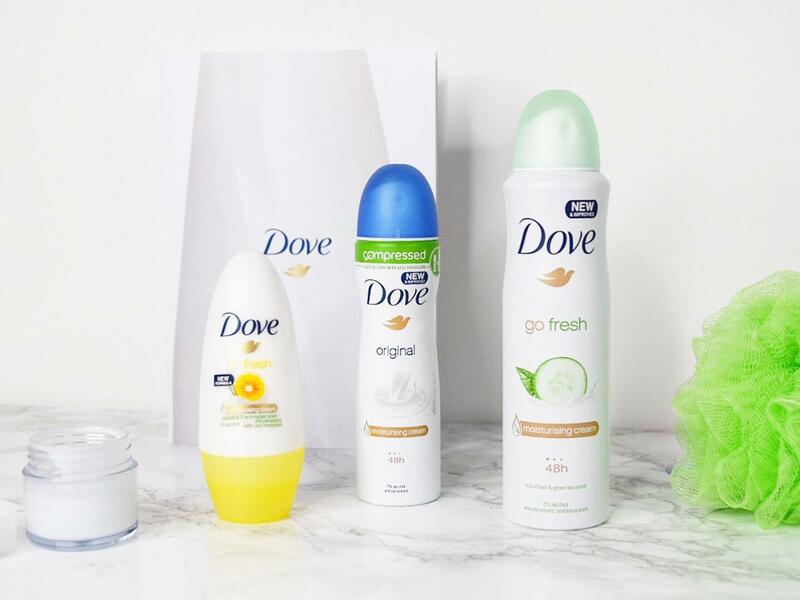 My personal favourites are the Dove Soft Feel or Invisible Dry for every day and the Go Fresh Cucumber and Green Tea for if I am going to be outside or going to the gym, just as the scent is slightly stronger and fresher but clean and crisp so not overpowering. There are so many style and scent options I think you would be hard pressed not to find one that suits you perfectly. Question of the day is, have you ever thought of treating your underarm skin like your facial skin? Let me know!